Nothing lasts forever, and this goes for pipes and plumbing, especially if you are in an ancient house. Aging pipes can become restricted, which in turn discolors water and affects water pressure. Your pipes will wind up corroding, rusting, decaying, and causing you problems. Sure, you can deal with a not-so-great water pressure in the shower; it will lead to bigger, more costly problems later on. We’re talking the possibility of getting leaks, floods, or even raw sewage leaking into your home and costing you thousands of dollars in damage to your home. Know the signs and when it is best to replace your plumbing before you run into a disaster. Stop! This does not mean that you must replace every single pipe in your house and the whole plumbing system must be gutted. This means that you need to follow these tips and learn when you need to replace and when you are okay. 1. Know what pipes inhibit your house: When it comes to supply pipes, that is, the pipes that are under constant pressure, brass pipes can last between 80 and 100 years, copper pipes can last between 70 and 80 years, and galvanized steel can last between 80 and 100 years. Drain lines tend to have a shorter life span. Cast iron pipes tend to last between 80 and 100 years; however, P.V.C, usually last between only 25 and 40 years! But don’t panic. Just because your pipes are older than the years mentioned above doesn’t mean that you need to rush out and replace them. Well-maintained pipes can last longer than the guideline above. Just keep an eye on them, and you should be fine! 2. Get rid of Lead and Polybutylene: These pipes need to be removed from your house as soon as possible. While they may seem fine they can sneak lead into your drinking water and harm the health of your family. 3. Keep an eye out for problems: You may think that a small leak is something that can just be overlooked and you can deal with later. But this is a misconception as small leaks lead to bigger problems as well as eat up a hole in your water bill. On average small leaks cost you 14% of your water bill. 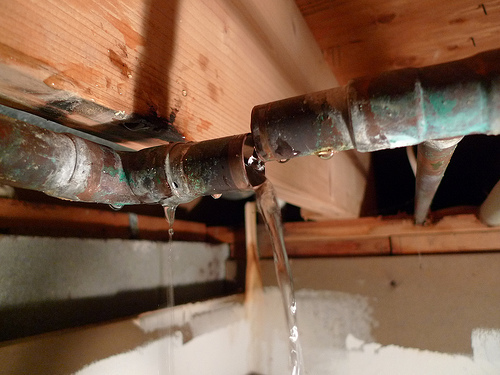 Keep an eye out for leaks, and check exposed pipes frequently for signs of corrosion.